The Martin winter has commenced in the northern hemisphere. The remarkable thing about this winter is that we have two active weather stations on both sides of the planet for the second Martian winter in a row! 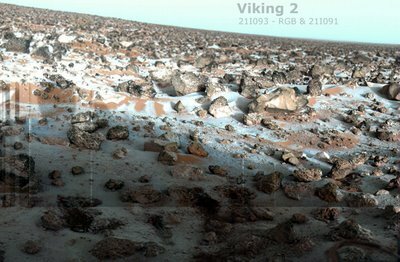 The two rovers – Spirit and Opportunity – are about the engage the Red Planet in what we on earth would describe as a COLD winter indeed. In my book, Abyss of Elysium – Mars Wars, I describe the winters on Mars as making Siberia look like Miami Beach in the summertime. The temperatures will drop anywhere from minus 200 to minus 225 degrees Fahrenheit. When the sun rises on Mars in the winter, the ground (as shown in this 1976 Viking lander photo) is typically covered in carbon dioxide frost that has settled out from the air during the long, bitterly frigid night. But, having grown up on the Earth’s mid-latitudes, a Martian winter is actually quite boring in comparison. During the Martian winters, the atmospheric pressure actually drops (from its already LOW 1/100th of earth’s air pressure) because a significant portion of the carbon dioxide is frozen out of the air and deposited on the poles and around the planet here and there. And the amazingly active pattern of daily dust devils slows to a near stop as the energy is sucked out of the air. But it is nothing like a winter on earth. The winter of earth is preceded by life’s colorful response during the autumn. Then, of course, the fall rains set in and as the air gets colder, the mighty, dense earth wind blows and the snows begin. It is nothing at all like a typical, slow, boorish Martin winter that will last an entire earth year. I’m happy to observe the Martian winter via the plucky little rovers from my warm study here on earth. Things are slow there and I’m fully content to observe and participate in our more rapid and lively seasons here on the home planet.